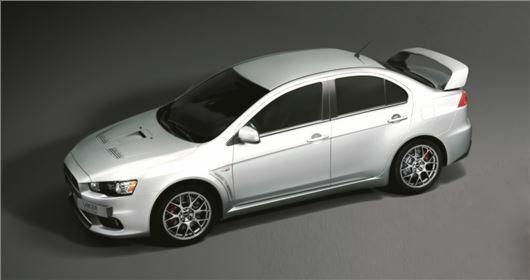 Mitsubishi is celebrating its 40th anniversary in the UK with a special edition Lancer Evo X. The FQ-440 MR packs 446PS and will be strictly limited to just 40 cars. Prices will start at £50,000 and the model will only be available in Frost White when it reaches the UK in May. The FQ-440 gets a number of improvements over previous incarnations of the Evo X, which include a new ECU remap for the turbocharged 2.0-litre engine. The four-cylinder unit will now develop 412lb ft of torque at 3100rpm and is mated to a six-speed dual clutch auto ‘box. Mitsubishi has also added a Janspeed exhaust system, high-flow fuel injectors and lowered the suspension by 35mm at the front and 30mm at the rear. To complete the high performance makeover, the FQ-440 sports 18-inch BBS alloy wheels, Recaro leather bucket seats and features an on-board diagnostic system that will record driving style, performance and vehicle diagnostics. The data recorder will supply data to both the driver and manufacturer and its fitment is a condition of the vehicle warranty. A three year subscription to the service is included in the vehicle price. As usual, servicing schedules will be short, with service intervals at 4500 miles or six months, whichever comes first. The FQ-440 is also supplied with a three year warranty, which is limited to just 36,000 miles. Will this have an SST transmission?